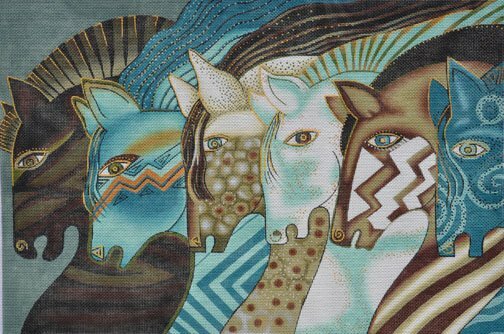 A stunning needlepoint design by Laurel Burch and Danji Designs called Embracing Horses is in browns and beautiful pastel blues & greens. The design area measures approximately 12" x 18". The design is handpainted onto 18 mesh mono Zweigart needlepoint canvas. This needlepoint comes with or without fibers. If you select cotton we will send DMC cotton floss. For silk we use Planet Earth Pepperpot boutique fibers which are single-ply for 18 mesh; for mixed threads we will send Silk, cotton and some Glisten by Rainbow Gallery. If you require stretcher bars we recommend a pair of 16" and a pair of 22" bars and some thumb tacks. This Embracing Horses needlepoint canvas usually ships within 10 days.